Congratulations to the guys at Podrophenia, who have just aired the 50th edition of their tasty radio show/podcast. 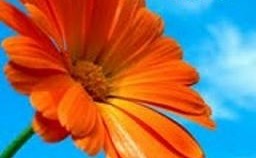 Recorded in a bunker hidden beneath the golden streets of sunny Southend in Essex, Podrophenia is hosted by two dons of the UK music blogging world – Mondo from Planet Mondo and Piley from Start The Revolution Without Me. Each programme has a different theme (Charity Shop Classics and Ghosts, Ghoulies, Gremlins are among the memorable recent offerings) and Podrophenia 50 is a film special handily called, err, The Film Special. Tune in for Jackie Mittoo’s reggae version of “From Russia With Love”, Sigue Sigue Sputnik frontman Martin Degville covering “The Streets Of London”, and a pre-Small Faces Steve Marriott kicking up “Consider Yourself” from the original stage production of “Oliver!”, plus tales of the six-fingered man in “Get Carter” and how The Beatles talked about buying the film rights to “The Lord Of The Rings” back in the Sixties. 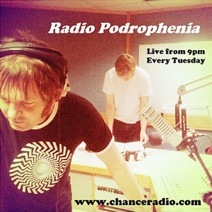 You can hear Podrophenia live on Tuesdays at 9pm on Chance Radio or click here to access the Podrophenia library at Planet Mondo and listen to the pods of your choosing at your leisure. While Mondo and Piley are old hands at this podding thing, Steve Worrall from the Retro Man blog isn’t too familiar with the world of microphones and jingles, although you’d never guess that from his debut Retro Sonic pod. It’s a confident start and no mistake. The Retro Sonic 1 playlist takes in American psychedelic soulsters The Chambers Brothers, Aussie punk pioneers The Saints and Mancunian powerpopsters Fast Cars, and Steve’s got some quality guests with him in the studio as well – rock photographer Paul Slattery, who is maybe best known for his shots of The Smiths and Oasis, and the walking punk encyclopedia that is Adam Donovan from The Jetsonics. Well, when I say ‘studio’, I’m not sure they are actually in a studio, because there’s a big log fire crackling away in the background. “Think of it like the crackles on a nice bit of worn vinyl,” says Steve. 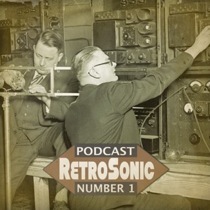 Click here for Retro Sonic 1 and here for a special bonus Retro Sonic interview with Paul Slattery.